Figure 2-29 Relationship of municipal BOD5 loading rate ca. 1995 and EPA Construction Grants Program awards by catalog unit. Source: USEPA GICS database and Bondelid et al., 2000.
maintenance costs as current year dollars) for water pollution control activities during the period from 1972 through 1994 (Figure 2-30). As shown in Table 2-18, current year dollars compiled in the annual survey have been indexed to constant 1995 dollars using the Chemical Engineering Plant Cost Index for capital costs and the consumer-based Gross Domestic Product for operating costs as appropriate indices. The Construction Grants Program provided federal grant support to local municipalities that amounted to almost one-half of the public sector costs and about one-third of the total public and private sector capital investment for water pollution control. USEPA (1997) estimates that by 2016 approximately 2,400 new facilities with secondary or greater than secondary levels of treatment will be needed to service an additional 85 million people (a 45 percent increase of total population). Further, during that time period the Agency estimates that 115 of the approximately 176 POTWs currently providing less than secondary treatment will upgrade their facilities to meet the minimum technology requirements of secondary treatment under the CWA. USEPA estimates the costs for POTW construction and upgrades to be $75.9 billion (indexed to constant 1996 dollars). 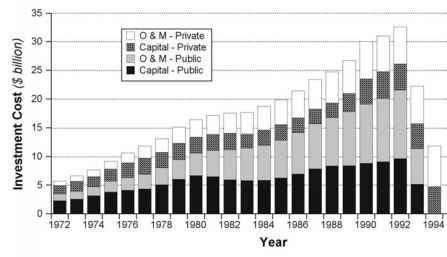 Figure 2-30 Annual water pollution control expenditures (as current year dollars) by the public and private sectors for capital and operations and maintenance costs from 1972 through 1994. Source: Vogan, 1996. "EPA Construction Grants Program (1956-1972): data obtained from EPA-OWM files compiled by R. K. Bastian, March 1992. 'EPA Construction Grants Program (1970-1995): data obtained from EPA GICS database, August 1995. 'EPA Clean Water State Revolving Fund (CWSRF) (1988-1999): data from EPA-OWM files by R. K. Bastian, April 2000. ''Public and private sector (1972-1994): Data from Vogan (1996). Data obtained from T. Gilliss, EPA-OPPE, 1997. 'Current year dollars adjusted to equivalent constant 1995 dollars. Plant Cost Index obtained from Chemical Engineering (CE, 1995) for capital expenditures. Gross Domestic Product for O&M costs obtained from Council of Economic Advisors (1997). • $44.7 billion (indexed to constant 1996 dollars) to meet infrastructure needs associated with CSOs. • $7.4 billion (indexed to 1996 dollars) to meet the Clean Water State Revolving Fund (CWSRF)-eligible portion of the costs that the municipal separate storm sewer systems are expected to incur for the development and implementation of a stormwater management program in response to the Phase I NPDES storm-water program regulations. • $3.8 billion (indexed to 1996 dollars) to meet the CWSRF-eligible projects related to cropland, pastureland, and rangeland. • $2.1 billion (indexed to 1996 dollars) to meet the CWSRF-eligible projects related to confined animal facilities with fewer than 1,000 animal units. • $3.5 billion (indexed to 1996 dollars) to meet the CWSRF-eligible projects related to silviculture. The purpose of this chapter is to address the first leg of the three-legged stool approach for answering the question posed in Chapter 1: Has the Clean Water Act's regulation of wastewater treatment processes at POTWs been a success? Recall that the basic goal of this first leg is to examine the extent to which the nation's investment in building and upgrading POTWs to secondary and greater than secondary wastewater treatment resulted in a decrease in effluent BOD loading to the nation's waterways. If evidence showed that these investments achieved significant reductions in the discharge of oxygen-demanding organic wasteload to the nation's waterways, the first leg of the investigation could add cumulative support for the conclusion that the CWA's mandates were successful. This section summarizes the key points presented in Sections A through F of this chapter, discusses conclusions, and addresses future trends in wastewater infrastructure requirements. Specifically discussed in Sections A and B is the significance of water supply and wastewater treatment in the urban water cycle, the invention of secondary treatment, and the use of biochemical oxygen demand (BOD) as a measure of the pollutional strength of organic wasteloads. Section C focuses on the roles the federal government and the CWA played in establishing, and funding, secondary and greater than secondary treatment in the nation's POTWs. • All components of the urban water cycle must be in place and functioning properly to satisfy the needs of both water supply and water resource users. • In the "Great Sanitary Awakening" in the late nineteenth and early twentieth centuries, public infrastructure investment was focused primarily on the water supply side of the urban water cycle and sewage collection systems for the control of waterborne diseases and protection of public health. • Increasing urban populations in the first half of the twentieth century exacerbated water quality problems associated with the discharge of inadequately treated sewage in urban waterways. • Secondary treatment proved to be a breakthrough discovery in treating wastewater; by 1930, several cities, especially in the Northeast, Midwest, and far West, had incorporated the technology into their wastewater treatment systems. • Before 1972 and the passage of the CWA, municipal and industrial wastewater discharges were regulated by individual states based on state ambient water quality standards. The federal government's authority for water pollution control was restricted to interstate waterways under the Commerce clause of the U.S. Constitution. • The passage of the CWA resulted in the federal government's assuming a greater role in directing and defining water pollution control programs in the nation. The states' water quality-based approach for regulating wastewater discharges was replaced by the CWA's two-pronged approach—a mandatory technology-based approach supplemented by a water quality-based approach on an as-needed basis—and enforced under the National Pollutant Discharge Elimination System permit program. • Section 301 of the CWA required POTWs to achieve effluent limitations based on secondary treatment as the minimum level of technology. Establishing a national policy requiring secondary treatment of municipal wastewater as the minimum acceptable technology supplemented by more stringent water quality-based effluent controls on a site-specific, as-needed basis was a key provision of the 1972 CWA. This mandate, coupled with an increase in funding assistance to municipalities through the Construction Grants Program, led to a dramatic increase in the number of POTWs with secondary and greater than secondary treatment capabilities. • The U.S. population served by POTWs with secondary or greater treatment almost doubled between 1968 and 1996 from 85.9 million people in 1968 to 164.8 million people in 1996! • BODu loading to POTWs (influent loading) increased significantly. In 1968, influent BODu loading was 34,693 mt/day. By 1996, influent BODu loading stood at 46,979 mt/day, a 35 percent increase from 1968! The same trend was seen for influent BOD5 loading to POTWs. 1968, effluent BODu loading was 21,281 mt/day. By 1996, effluent BODu loading stood at 16,325 mt/day, a 23 percent decrease from 1968! Effluent BOD5 loading was also significantly reduced (by 45 percent) over the same time period. BOD removal efficiency increased significantly. In 1940, the aggregate national removal efficiency stood at about 33 percent for BOD5 and 20 percent for BODu. By 1968, removal efficiencies had increased to 63 percent for BOD5 and 39 percent for BODu. By 1996, these had increased to nearly 85 percent for BOD5 and 65 percent for BODu! Increasing numbers of people served by POTWs in the twenty-first century will likely reverse the trend established between 1968 and 1996 of decreasing effluent BOD loading to the nation's waterways. Assuming that national aggregate design-based BODu removal efficiency will increase to 71 percent, influent wastewater flow will remain a constant 165 gpcd, and influent BODu concentrations will remain a constant 396.5 mg/L, population projections indicate that, by 2016, effluent BODu loading will increase by 20 percent to 19,606 mt/day, equivalent to the rate in the mid-1970s. It is projected that, by 2025, the effluent BODu loading will be 21,280 mt/day, a rate approximately equal to that observed in 1968 when the discharge of oxygen-demanding material from POTWs reached its historical peak! By 2016, when the projected needs for wastewater treatment are expected to be met (USEPA, 1997), the overall BODu removal efficiency of 71 percent and increases in population will result in a 20 percent increase of effluent loads relative to the 1996 loading rate. To maintain an effluent BODu loading rate comparable to 1996 conditions through 2016 (i.e., "running in place"), the national aggregate removal efficiency would have to be increased from 71 to 76 percent. This would need to be accomplished by shifting the projected population served from secondary to advanced secondary and advanced wastewater treatment facilities. • Of the 2,111 catalog units in the contiguous United States, 1,632 receive municipal discharges. • Twenty percent of catalog units account for 90 percent of the total municipal BOD5 loading. Highest rates of municipal loading of BOD5 occurred in the Mississippi River Valley and the Northeast and Midwest. • Municipalities (POTWs) are the dominant source of the BOD5 component in catalog units associated with major urban areas. 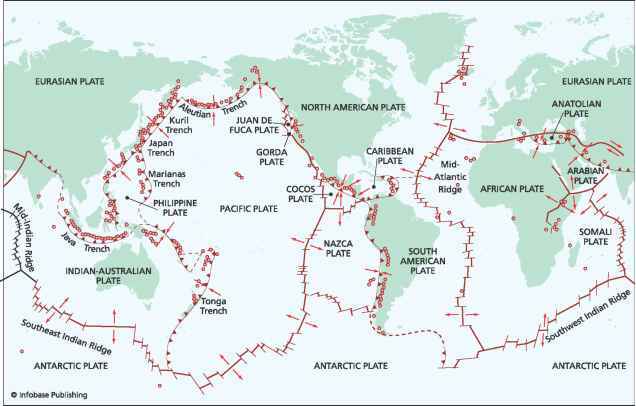 Several urban areas had rates greater than 25 mt/day. • Municipal BOD5 loadings account for about 38 percent of total point source loadings and 21 percent of total loadings (point and nonpoint). • Industrial (major and minor) BOD5 loadings account for about 62 percent of total point source loadings and 34 percent of total loadings (point and nonpoint). • Urban stormwater and CSOs account for about 5 percent of total nonpoint source loadings and 2 percent of total loadings (point and nonpoint). • Rural nonpoint source BOD5 loadings account for about 95 percent of total nonpoint source loadings and 43 percent of total loadings. Clearly, continued improvement in water quality conditions of the nation's waterways will require an integrated strategy to address all pollutant sources, including both point and nonpoint sources. • From 1970 to 1995, the Construction Grants Program has distributed $61.1 billion (as current year dollars) to municipalities for POTW building and upgrades. The federal share was 75 percent of total costs from fiscal years l973 to l983, and 55 percent thereafter. • From 1988 to 1999, an additional $16.1 billion (capitalization) in federal contributions was also distributed to the states through the Clean Water State Revolving Fund. • From 1972 to 1994, approximately $200.6 billion in capital costs and $210.1 billion in operation and maintenance costs (as current year dollars) were spent by the public and private sectors for point source water pollution control. Based on these figures, the Construction Grants Program has contributed almost one-half of the public sector costs and about one-third of the total public and private sector capital investment for point source water pollution control. • Excluding combined sewer systems and urban stormwater controls, USEPA estimates $75.9 billion (1996 dollars) will be required to meet traditional wastewater treatment plant (and sewer) needs through the year 2016 (USEPA, 1997). Grants Program and Clean Water State Revolving Fund, resulted in a dramatic decrease in effluent BOD loading from POTWs to the nation's waterways. This decrease was realized in spite of significant increases in influent BOD loading that occurred due to increases in the population served by POTWs. Based on needs data submitted by the states, USEPA projects that by the year 2016, 18,303 POTWs in the United States will be serving a population of 274.7 million (USEPA, 1997). Excluding combined sewer systems and stormwater controls, the Agency estimates that $75.9 billion (1996 dollars) will be required to meet traditional wastewater treatment plant and sewer needs at this projected level of service. Based on these projections, influent BODu loading in 2016 is estimated to be about 68,030 mt/day, a 45 percent increase in influent BODu loading from 1996 (see Section D). Assuming a BODu removal efficiency of 71 percent based on the effluent loads contributed by different categories of POTWs (USEPA, 1997), effluent BODu loading in 2016 would be about 19,606 mt/day. The projected effluent BODu loading of 19,606 mt/day in 2016 is a concern. Directly and indirectly due to the implementation of the CWA, there was a downward trend of effluent BODu loading rates beginning in the early 1970s through at least 1996 (the endpoint year of this study). The highest effluent BODu loading rate, 21,281 mt/day, was estimated to have occurred in 1968, four years before the passage of the CWA, and the lowest, 16,325 mt/day, in 1996. The 2016 effluent BODu loading estimate reverses the downward trend, with a 20 percent increase in effluent loading over the 20-year period from 1996 to 2016. This level of loading is equivalent to the effluent BODu loading rates in the mid-1970s. Further, effluent loading rates projected to 2025 reveal that the nation may experience loading rates similar to those occurring in 1968, a time when the symptoms of water pollution were especially acute. These findings underscore the importance of incorporating pollutant loading estimates and corresponding water quality improvements into POTW needs surveys. Projected large increases in service population have the potential to overwhelm the gains made to date in effluent BOD loading reductions due to the CWA. To continue the downward trend in effluent BOD loading to the nation's waterways, further improvements need to be made in technologies and actions that decrease influent BOD loading to POTWs (through conservation methods) and increase BOD removal efficiency in the nation's POTWs (through more advanced wastewater treatment methods). In the 30 years since the passage of the CWA in 1972, a majority of the national water pollution control efforts have focused on controlling pollutants from POTWs and other point sources. National standards ensure that every discharger meets or beats the performance of the best technology available. Continuing the success achieved to date in reducing BOD and other pollutants, however, will require additional investment as older facilities wear out and increasing population pressures demand that existing facilities expand and new facilities be constructed. If these investments are not made and treatment services do not keep pace with growth, many of the gains achieved by the effluent loading reductions that have occurred in the years after the CWA will be lost (WIN, 2000). If this occurs, the wastewater treatment component of the urban water cycle will again assume "weak link" status, with corresponding detrimental consequences to water resource users.